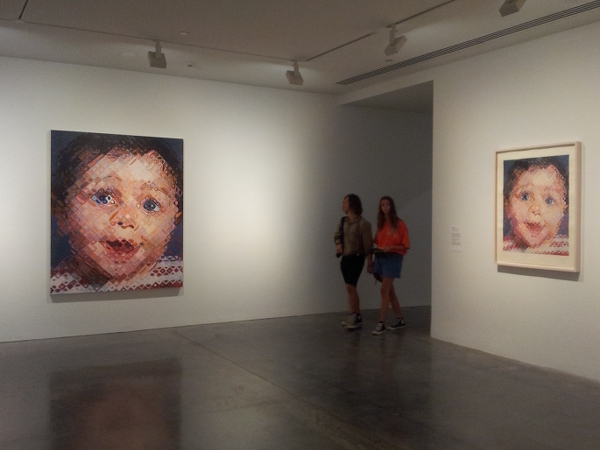 It’s late to write about this exhibition at the Museum of Contemporary Art in Sydney (link). It closed a week or two ago, I went to a talk by curator Terrie Sultan last November and have lost my notes… still, a couple of thoughts I want to capture. It was fascinating to see the process of printing exposed. 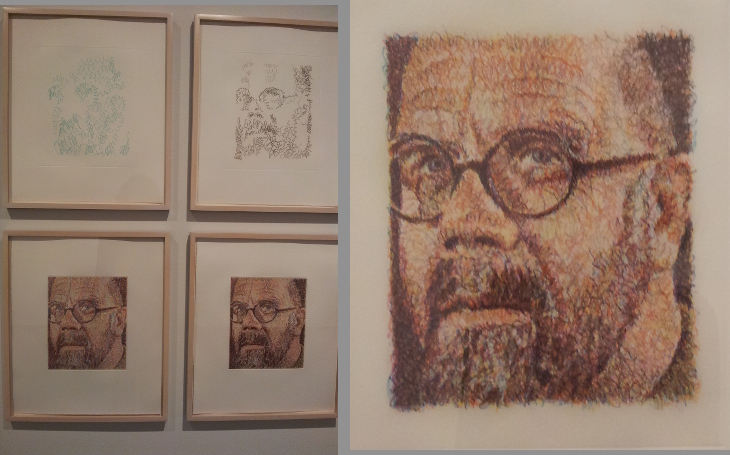 This is Self-Portrait/Scribble/Etching Portfolio 2000 – 12 plate proofs, 12 progressive proofs, and the final work. Meticulous method. The slightest marks (and spaces) are significant in the final. On the left of the image is an oil pointing by Close, Emma (2000). 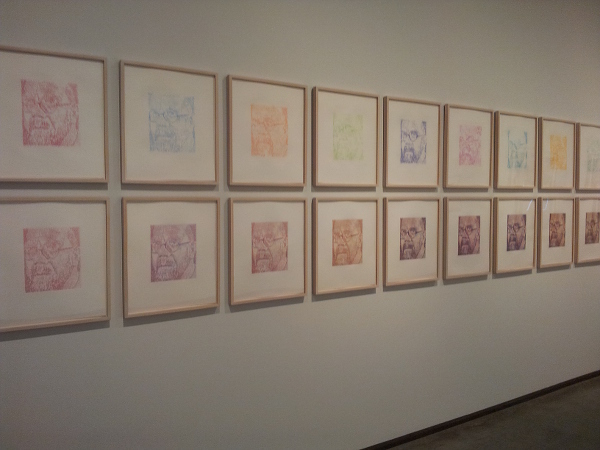 On the right, Emma (2002), a 113-colour hand printed ukiyo-e woodcut, printer Yasu Shibata. Throughout his career Close has collaborated with others, often printers. He listens to people, inspires them, will trust them, will take risks, will push them. A larger image of the print and some of the plates is below. A wide range of techniques had been used in the various works. Close’s oil paintings, plus mezzotint, silkscreen, aquatint (spitbite), ukiyo-e prints, pulp paper, hand stamp – and here, fingerprints. Leslie/Fingerprint (1986) is direct gravure, a type of etching. 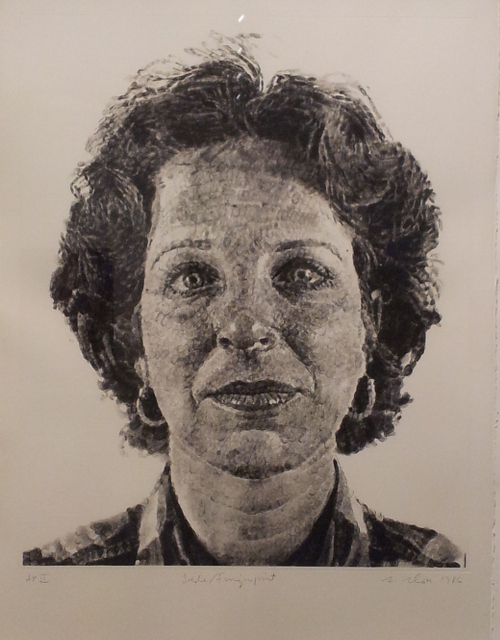 To quote the exhibition signage: “Close fingerprinted [Leslie’s] face on a translucent sheet of Mylar. That image was then applied to a photosensitsed surface, bitten with acid, and printed. Shades of light and dark were controlled by how much pressure the artist applied with his fingertips”. Again the collaboration, but also the inventiveness and openness. The “depth” is how much can be found in front-on closeups of faces. Often the same faces used again and again using different techniques. But the depth isn’t in exploring the psychology or personality of the apparent subject. In a large image (almost 1.5 m high) of a woman’s face, the work seems to me more about the artist whose fingerprints form the image. Like many of the prints shown, this forcefully asserts the handmade in what could otherwise be perceived as a mechanical process of printing. It asserts the presence of the artist. Or rather, lack of emotion. 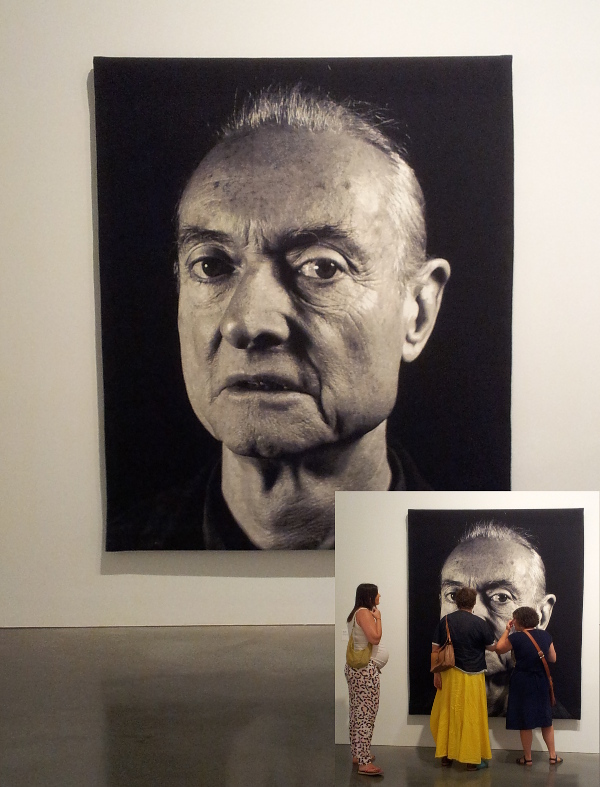 On the right is Roy (2011), described as a jacquard tapestry. I’ve inserted a photo showing how large the work is, and how close we were able to get to it. I have expectations of textiles. To me cloth brings the potential for multiple associations, to be charged with emotion, to cry out to be touched … This work feels like an intellectual exercise – more that’s interesting, let’s see how far we can push the technology, let’s see how the image changes, how it responds to this different technique. Clearly viewers found it fascinating, drawn close to the work. I found it fascinating, but I don’t think it made me feel or see something new or unexpected emotionally. Feeling the lack has helped me think more about what I want/expect from textiles. 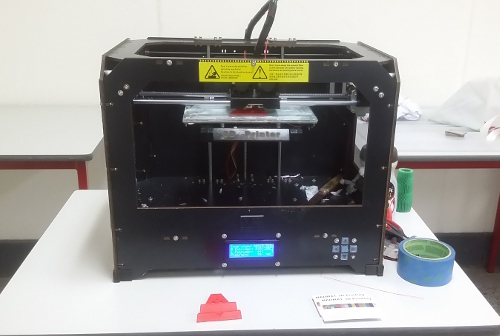 This was an evening class, a 3 hour introduction into the huge range of materials, techniques, possibilities and opportunities in 3D printing. On the left is the printer demonstrated in class by Mat, our tutor. He described it as “really a glorified glue gun”. It lays down layers of material, using a spool of plastic that looks like whipper-snipper line (which was actually used in earlier days). It’s a resource-friendly additive process – I quite like the parallel to weaving, adding picks (layers) of weft to create the cloth. There’s been chatter in the past about printing plastic guns and so on, but while theoretically you could they wouldn’t be very good guns. Better examples are shoes from a scan of the foot, prosthetics that fit exactly and are cheap enough to upgrade each year as a child grows, a coconut cutter that was everywhere in your village but nowhere to be found in Sydney. With 3D printing you can create unique and/or customised items, or replacement parts not kept in inventory, or prototypes while developing that new gadget that will take the world by storm. For actual manufacture in bulk you’d move to injection moulding or other faster and cheaper methods. Mat took us on a whirlwind tour of the various methods in use – extrusion, wire, granular, powder bed and inkjet head, laminated and light polymerised. He talked sintering and stereolithography and ceramic plaster… but what I was really focused on were the techniques and materials available to me now, reasonably locally and economically, with my Mixed Media for Textiles course in mind. FDM (fused deposition modeling), as in the printer Mat showed us, is the most affordable, using polymer filaments – many types available in a wide variety of TLAs (three (or two) letter acronyms). There seems to be a lot to think about when printing – the grain of the printing (greater weakness on the z-axis), adhesion to the printing plate, temperatures, nozzle diameter, printer speed, layer height… and that’s after you’ve actually designed your item. It seems like a lot, but there is a very active community on the internet, lots on YouTube, and various service providers including Mat. The workshop includes printing of a small item of our own design, so I’ll be sending my file off to Mat soon. I’m really excited about the possibilities for combining the printed items with textiles, so the plan is to start experimenting with that. I also want to get hold of some polymorph plastic, which melts in hot water and you can then mould by hand, and perhaps a 3D pen. http://madmat3dprinting.com.au/ – website of our tutor, Mat Danic. https://www.facebook.com/MADTechSupport/videos?fref=photo – videos Mat has shared. In particular https://www.facebook.com/video.php?v=443910142439183&set=vr.443910142439183&type=2&theater, which shows the polymorph plastic.